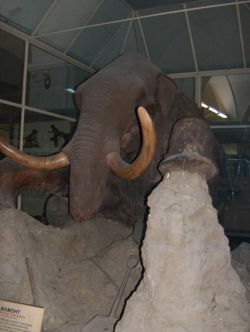 The mammoth is an extinct form of elephant. There are three different types of mammoths whose skeletons have been found in North America. The woolly mammoth (M. primigenius), the Columbian mammoth (M. columbi), and Jefferson's mammoth (M. jeffersonii). They are about the same size as modern day elephants, contrary to the common belief that they are much larger. However their tusks could get up to about 16 feet long. They reproduced sexually, giving birth to one young at a time, and lived to be about 60 years old. They were strictly herbivores and ate mainly grass. Mammoths have very special teeth that God designed specifically for eating grass. A mammoth skeleton on display in Taiwan National History Museum, Taipei. It is said that mammoths mated and reproduced almost identically as that of modern day elephants. The gestation period is guessed to be about 22 months. They would only have one baby at a time, and in some cases only one baby in their whole life. It would take about 10-12 years to reach sexual maturity. Their average lifespan was about 60 years long. Despite initial assumptions that the two genera of mammoths could not interbreed, Woolly and Columbian mammoths interbred. A model of a mammoth in Nordhausen, Germany. Mammoth graveyard - from Noah's flood. ↑ Oard, Michael J (2012). 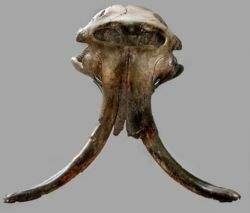 "Woolly and Columbian Mammoths Likely the Same Species". Journal of Creation 26 (2): 12-13. ISSN 1036-2916. The Great Mammoth Mystery...SOLVED! Webcast featuring Michael Oard, Ken Ham, and Carl Wieland. This page was last modified on 14 August 2015, at 12:02.